Everyone loves it when rude drivers get their comeuppance. Expensive car or not, bad manners on the road should not be tolerated. While it’s not the total write-off that we’ve come to expect from most dash-cam footage, this latest video still delivers a delicious slice of schadenfreude that should be enough to tide you over ’til the next fail inevitably appears online. Footage has emerged of a Corvette driver who refused to let a truck merge into his lane getting his just desserts. 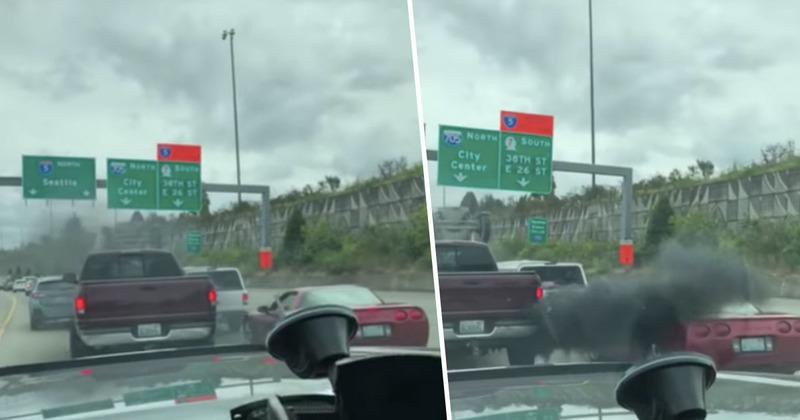 After the red Corvette blocks his path and, for some reason, rolls down his window to give the trucker the finger, the truck driver unloads a cloud of thick black smoke directly through the Corvette’s open window. The accuracy is amazing, it’s almost pinpoint precision, which makes you wonder – does this happen often to the truck driver, and the driver has somehow adjusted the exhaust to do this every time they come up against someone they don’t like on the highway? The person who caught the incident, which happened in Tacoma, near Seattle, Washington, can be heard laughing as the truck does its thing. Which seemed to work too, as at the end of the footage the Corvette appears to hang back to let the truck move ahead. Either that or he’s too busy coughing his lungs up to drive. I was driving though traffic near Seattle and noticed a Corvette not wanting to let a Dodge merge over into the lane, so the Dodge pulled beside him. 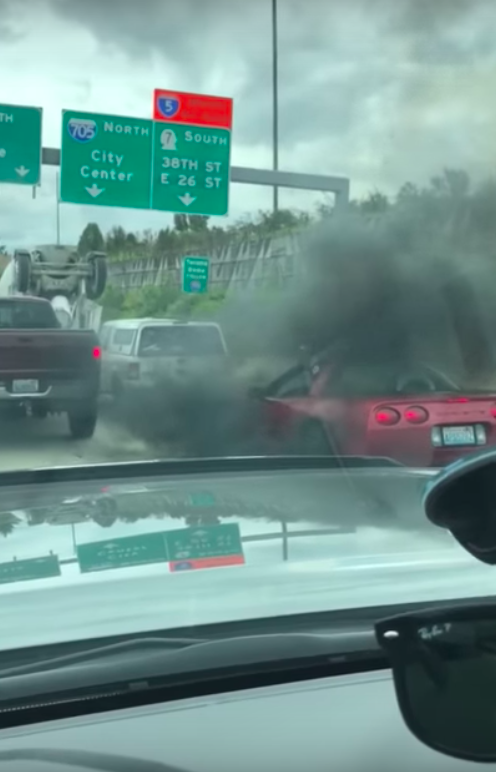 As the Corvette driving was rolling down his window and went to flip him off, the Dodge owner coaled him with so much smoke you couldn’t even see the driver in the car. He did end up letting the truck over. I’m not one to condone any kind of road rage, but it seems fighting fire with fire worked in this instance. In other dash-cam-related hilarity, another eyebrow-raiser has emerged of two guys trying – and massively failing – to pull off an insurance scam. 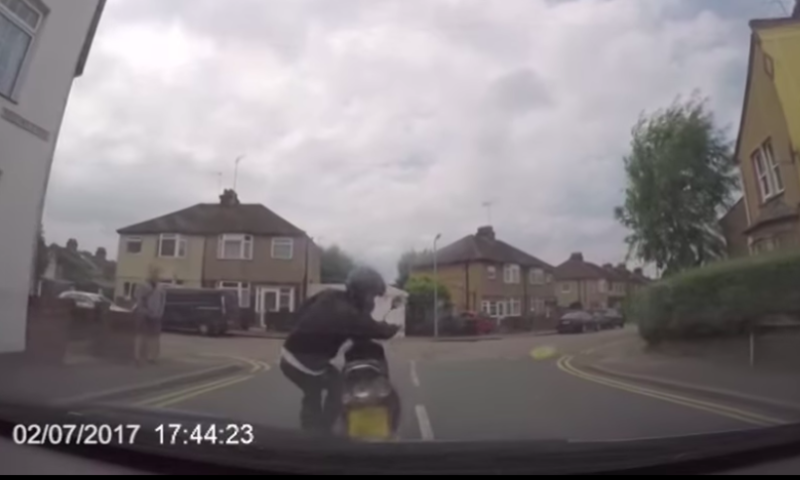 Footage shows a motorcyclist pushing his bike into the road right in front of a car before dramatically throwing himself backwards onto the car’s bonnet. The woman confronts the young lad and his mate who is filming the incident for insurance fraud purposes, of course. Dumbfounded, the two scarper off. The moral of the story here guys and gals: always invest in a dash-cam for your car. You never know when you’re gonna strike lucky with a piece of viral content that’ll bring a huge grin to my face.